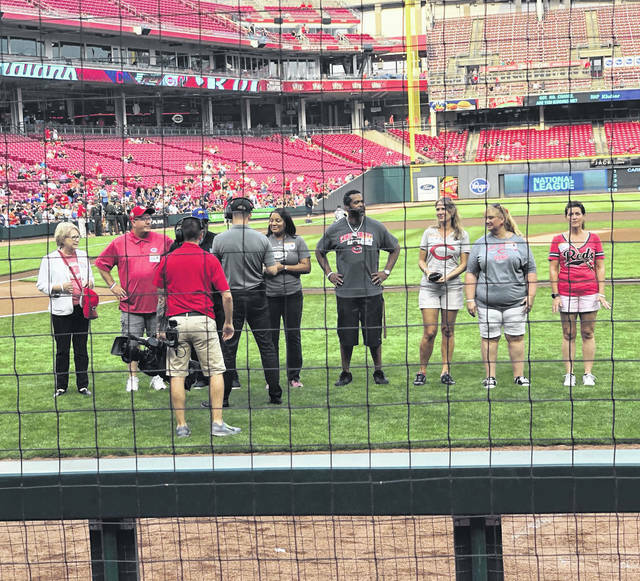 Greenfield resident Heather Gibson, second from right, is pictured on the field at Great American Ball Park before Tuesday’s Cincinnati Reds game. Heather Gibson is not a big baseball fan. But she said it was still a humbling experience when she was honored on the field Tuesday during pregame ceremonies before a Cincinnati Reds game at Great American Ball Park. For the past 15 years, Gibson, a Greenfield resident, has advocated with several different organizations for drug abuse prevention and those caught in the cycle of addiction. “It was amazing, it really was. They had all the mascots down there on the field and stuff like that, and it was really neat to look up into the crowd and see my kids waving at me,” Gibson said. She said tickets to the game were provided for her entire family, including her husband, Chet, who works with the Highland County Sheriff’s Office. The ceremony was organized by the Ohio Attorney General’s Office, who she works with closely now as the CEO for Reach for Tomorrow. She said that in her current role, she works on a variety of projects not just for Highland County, but for organizations across the state. When it comes to sports, Gibson said her favorite is football, and more specifically college football. The Reds lost to the Indians 8-1. In addition to her job with Reach for Tomorrow, Gibson also works with the Mount Washington Church of Christ Ladies Aid, is an associate member of the Y-Gradale, is a past president of the Highland County Drug Coalition where she is now the historian, and is on the Parent Advisory Council for the Southern Ohio Educational Service Center. She said that while she on the field at GABP, the public address announcer spoke about how important it is talk to kids about drug prevention. https://www.recordherald.com/wp-content/uploads/sites/27/2018/08/web1_Heather-Gibson-pic.jpgGreenfield resident Heather Gibson, second from right, is pictured on the field at Great American Ball Park before Tuesday’s Cincinnati Reds game.